We are in rural Montana on the banks of the Tongue River. We have lots of nature around us. Most times in early morning you can see deer crossing the river below the house. Pheasants strutting around the corrals. Geese floating down the river. A full country breakfast is served with family or off a beautiful deck over looking the river. Summer hunting for prairie dogs is a great pastime. We have an abundance of the little varmints. In the fall hunting is bountiful. Mule and white tail deer antelope are available. For the bird hunters there are sharptails, sage hens and pheasants. Special packages are available with extra meals included for the hunters. Hunters staying at our B&B hunt at no extra charge. We have 7,500 acres on which they may hunt. Also available are two modern trailers for those hunters who prefer privacy or who come in a group. 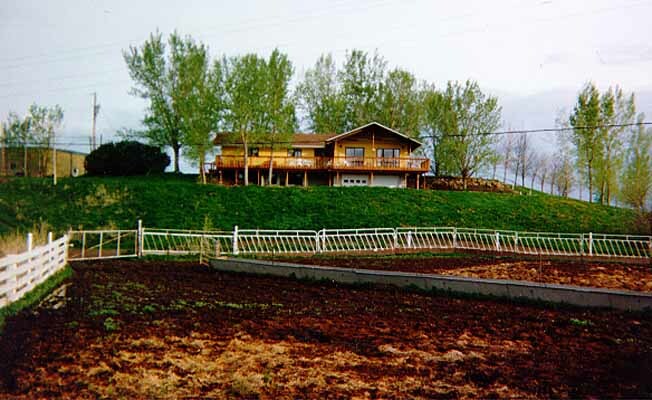 The Helm Riverbend Bed and Breakfast is located on the banks of the Tongue River. We are a working ranch raising Registered Hereford Cattle. We are just 15 minutes from Miles City, Montana. Travel south on Highway 59 to mile marker 13. Turn right on Highway 332. Go to 5 mile marker. Turn right at Helm Hereford sign and drive to the big yellow house.The Helm Riverbend Bed and Breakfast is located on the banks of the Tongue River. We are a working ranch raising Registered Hereford Cattle. We are just 15 minutes from Miles City, Montana. Travel south on Highway 59 to mile marker 13. Turn right on Highway 332. Go to 5 mile marker. Turn right at Helm Hereford sign and drive to the big yellow house.